England second-row Wade Dooley more than justified his nickname of "The Blackpool Tower". Standing at six fett eight inches tall and a Police Officer in Blackpool, Dooley amassed 55 England caps after making his debut against Romania in 1985. Dooley formed an effective partnership alongside fellow Police Officer Paul Ackford in the England second-row, and was selected for the 1989 British and Irish Lions tour of Australia. He played in the final two Tests as the Lions secured a series win over the Wallabies. 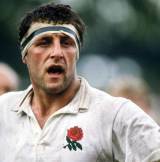 Dooley was then part of an England team that recorded Five Nations Grand Slams in 1991 and 1992 before he was selected for his second Lions tour in 1993. This time he returned home early however, to attend his father's funeral. His replacement was a young Martin Johnson. Dooley played the majority of his club career for Preston Grasshoppers, and retired after the 1993 Lions tour to continue as a Police Officer. Dooley ended his police career in 2007 and in December 2008 was announced as an RFU citing officer for the Guinness Premiership and newly-formed Championship.